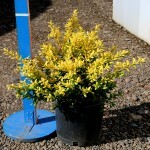 A slow growing shrub that has bright yellow outer leaves that contrast nicely with the dark, shiny green inner foliage. The leaves are small. 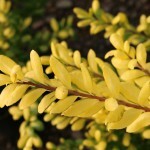 It does well in partial to full sun and a well-drained soil. Useful as a hedge, foundation plant, or a bright accent in the landscape. PP 14,420.